Following in his illustrious father's footsteps, Mariano Fortuny began as a painter. Perhaps overshadowed by the father's reputation, the son became intrigued by the father's large collection of antique fabrics. Mariano abandoned painting to become the greatest textile designer in history. Starting in 1908, he produced his celebrated textiles in the 15th-century Palazzo Orfei in Venice, now the Fortuny Museum. 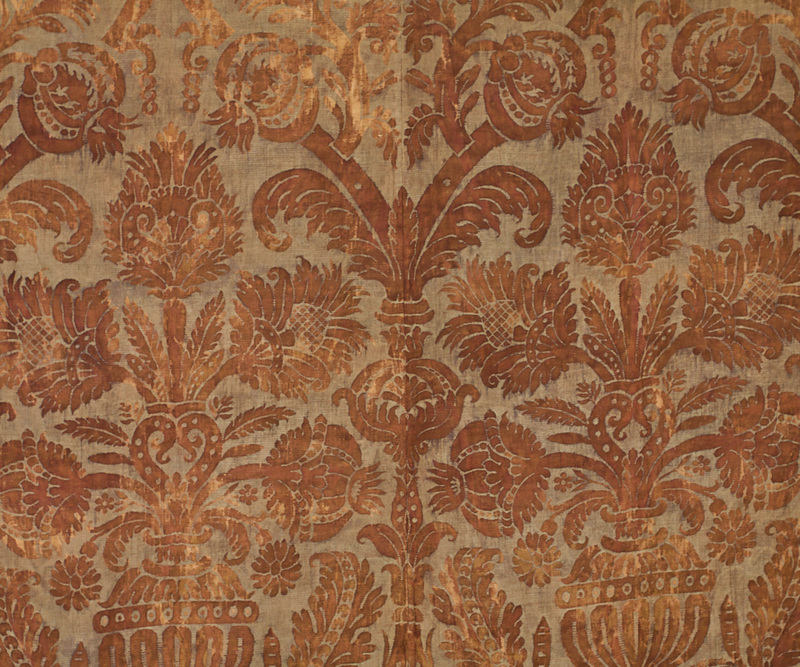 The popularity of Fortuny's designs had spread from the cultured elite to the broader public just when Europe was feeling impoverished after WWI. The expensive silk and velvet fabrics hand produced in his small workshop could not meet the demand. Thus, in 1919 he faced two imperatives: the need to increase production and to use less expensive cotton fabrics. His solution was a new company, Società Anonima Fortuny. The wall hanging is composed of two panels of stenciled cotton twill fabric sewn together in the center. There are hanging tabs on top (not shown in the pictures), a gold cotton sateen lining, and weights sewn in each corner. 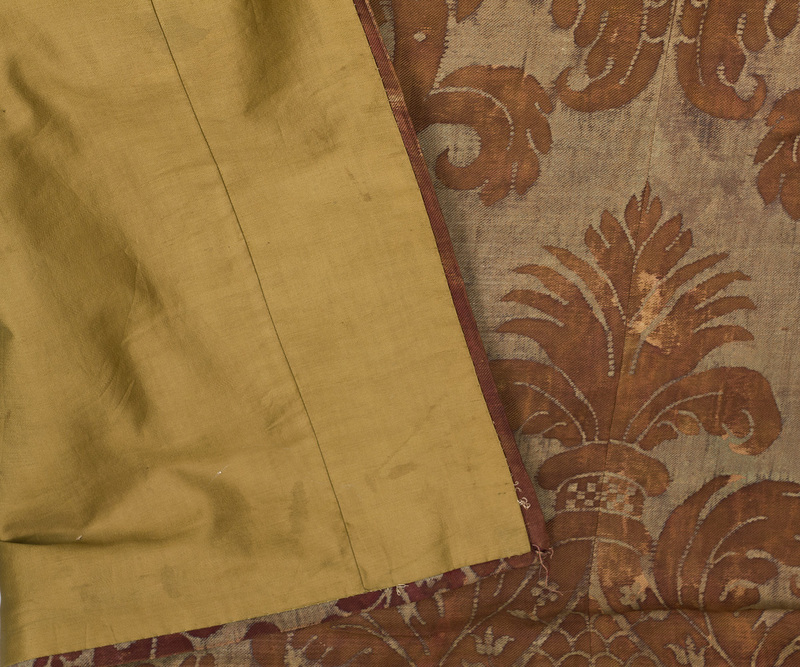 The selvedge edges with the Fortuny stamp had been trimmed off when I purchased the panels. 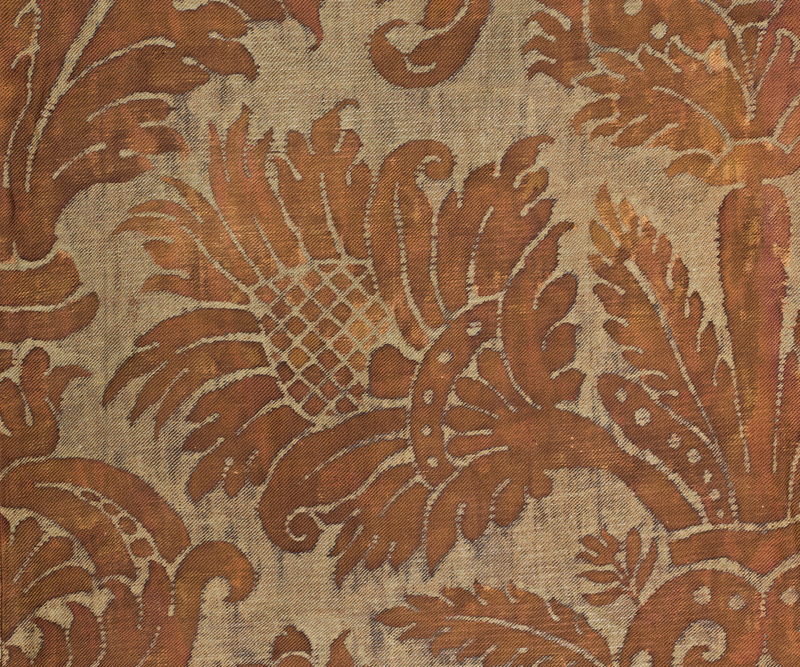 The stenciling was done on the textured, heavy cotton twill used in pre-1950s Fortuny textiles. The hand- finished print is delightfully uneven. 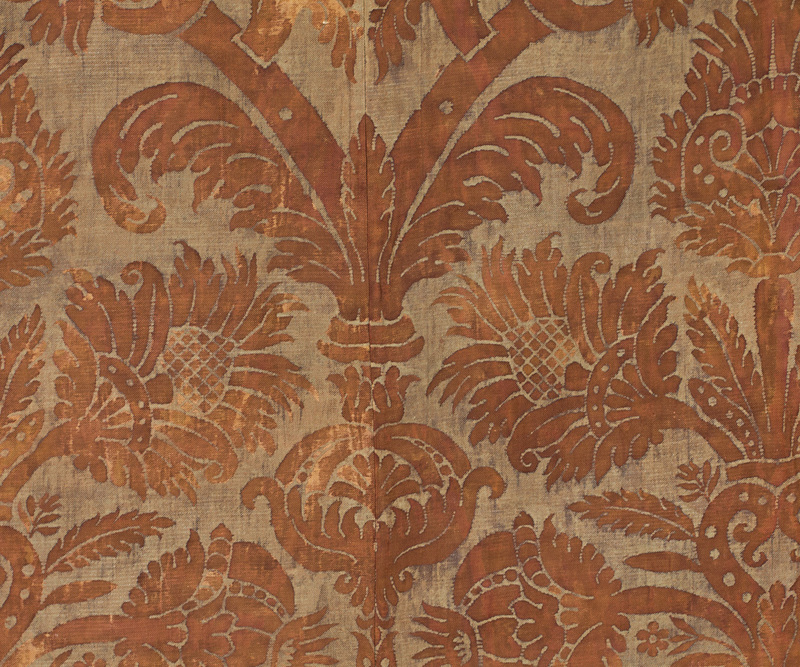 Fortuny, who emulated antique frescoes and textiles, would have appreciated the unevenness of color—the gift of Time to Art. 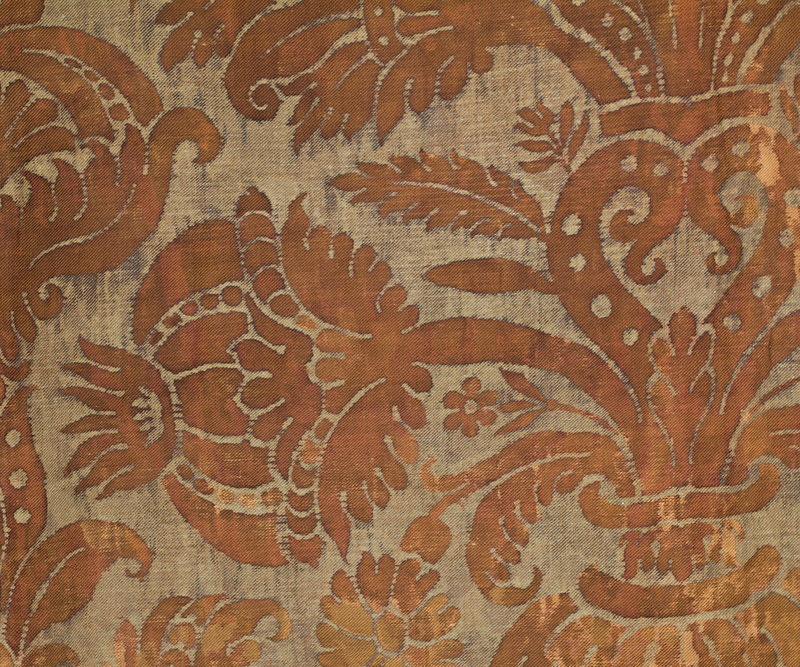 The dramatic revival of interest in Fortuny fabrics has been a major style trend in recent years. His magnificent fabrics were meant for wall hangings and furnishings. 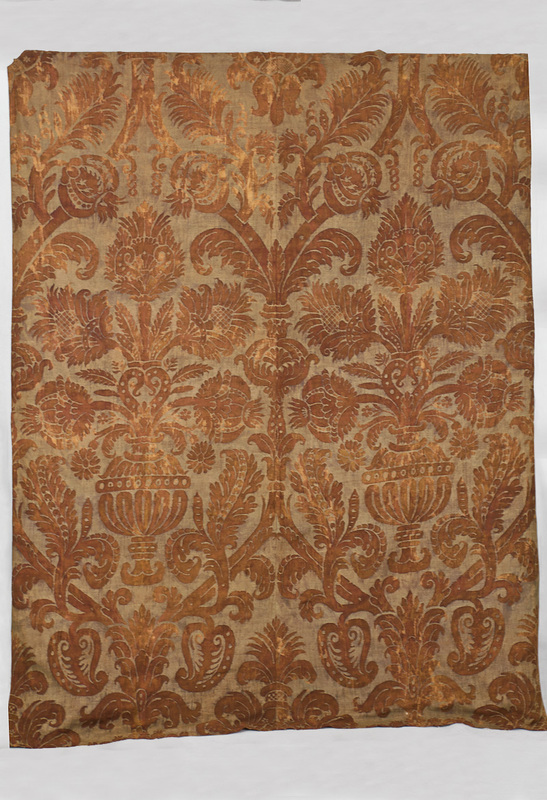 Although Fortuny stenciled patterns are still produced today, connoisseurs of textile art cherish and value the superior quality of the vintage pieces. The condition is very good. One tab is torn; and the lining has a tear. While I appreciate the antique charm of the faded areas, all these together are minor flaws, which are reflected in the price. It measures: 54" wide by 71" long. Each panel is 27" wide.